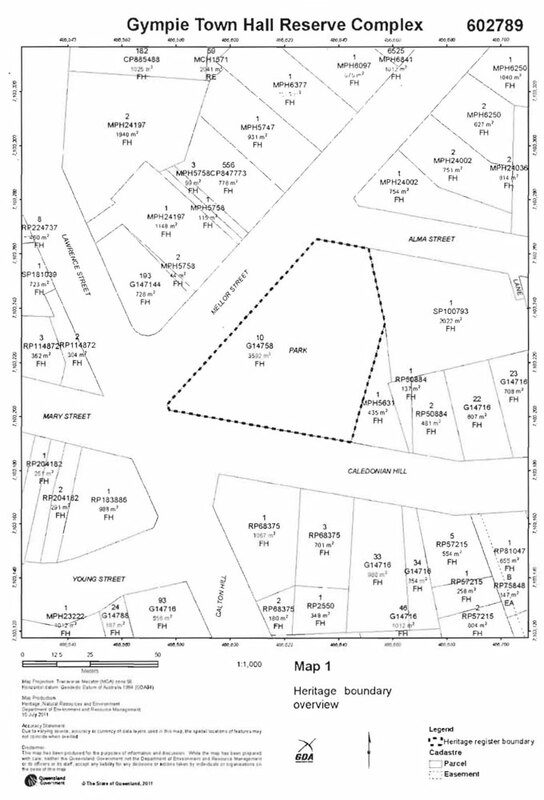 The Gympie Town Hall Complex comprising Town Hall, Garage, former Maternal and Child Welfare Clinic and Men's Toilet Block is located at the top end of Nash's Gully on a large wedge-shaped site at the fiveways intersection of Caledonian Hill, Calton Hill, and Mary, Lawrence and Mellor Streets, and is bound to the north by Alma Street in Gympie's central business area. 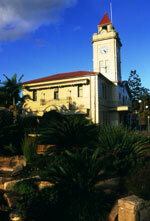 The Gympie Town Hall is a stately two storey masonry building with part basement and a grand bell tower. The building is prominently located on a busy intersection and has a two street frontage to Caledonian Hill and Mellor Street. Its elevated bell tower together with its high quality of design gives it considerable aesthetic appeal. The Town Hall, constructed in two stages, has an asymmetrically composed exterior form with Neo-classical characteristics which include the use of columns, a dominant pediment and decorative cornicing and quoins at the buildings corners to give the building a sense of solidity and robustness. Its exterior is carefully detailed and finished with smooth cement-render ruled to imitate ashlar. The bell tower is positioned over the main public entrance into the building and the surrounding roof, clad in corrugated metal sheeting is hipped over the circa 1890 portion and gabled over the circa 1938 portion. The building's south-facing Caledonian Hill facade has two major components reflecting its staged construction. The circa 1890 western end features a cantilevered street awning over the western entrance detailed with decorative cornicing and circular motifs. Horizontal banding visually distinguishes the building's two floor levels. Tall, rectangular windows puncture the western end of the elevation while a circular porthole style window is centrally located above the western entrance. From here the bell tower rises and features tall, rectangular windows and clock faces to all four sides. It is capped with a pyramidal roof and a scalloped parapet wall forms a solid balustrade allowing access to the bell chamber. Access into the circa 1890 end of the elevation is via timber paneled doors which open onto an octagonal-shaped and timber-lined entrance vestibule. A decorative leadlight fanlight is located above the entrance. Another pair of glazed and paneled swing doors on pivoting hinges provides access into the lower vestibule. Floors in the entrance vestibule are terrazzo with a central motif pattern. The circa 1939 eastern end is a symmetrical composition with large stucco quoins and capitals visually supporting the raked moulded cornice to the gable. The centrally placed entrance is framed by a projecting balcony with a wrought iron balustrade supported on Doric-style columns. A tall, arched doorway with ruled stucco keystone and reveals opens onto the balcony and is framed by tall rectangular windows with timber framed casements. Windows on the lower level are timber framed and recessed into the masonry facade and ornate wrought iron bars secure the openings. The entrance door has been replaced with an aluminum hinged door. The elevation facing west to Mellor Street has similar detailing to the main elevation. It is symmetrical in layout with stucco quoins emphasizing the corners while horizontal banding visually distinguishes the building's two floor levels. A false balcony runs along the upper floor level with decorative wrought iron balustrading and art nouveau style lights at each end. A large arched window framed with ruled stucco reveals, lintel and keystone rises from the lower level and is finished with a shallow awning formed from masonry supported on oversized decorative brackets. On the upper floor three tall rectangular windows with timber-framed double-hung sashes are sheltered by a timber framed window awning supported on pairs of carved timber brackets. Eaves gutters to the main roof and the upper window awning are formed from metal and are quad-profiled. The northern elevation where tall rectangular windows and a large arched leadlight window are located is simpler in detail. A lean-to roofed structure containing amenities is located on the lower level while a more substantial circa 1939 timber-framed verandah is located on the upper level accessed by timber-framed service stairs. The land is retained at the building line to allow access and light into a basement level and service yard. A lean-to structure has been recently constructed to the eastern end of the elevation. The symmetrical eastern elevation comprises stucco quoins at each corner. Large arched windows are located on the upper floor. A gable roofed side porch projects towards a service area on the lower floor and features a large arched window flanked by smaller timber-framed casement windows. Decorative square pilasters are located at the corners. Rectangular in plan with projecting wings to the east and northeast corner, the building is organised over two levels. The ground floor houses a foyer space, a former public office and clerk's office, a former post-office space, a former post-masters office together with several other offices to the north. Located on the first floor are the council chamber and vestibule, a former mayor's reception room and office, a kitchen and enclosed verandah. The ground floor foyer space has generous internal openings consisting of pairs of timber-paneled doors with lead-light glazed pivoting fanlights above. Walls and ceilings are plaster with decorative paneling formed by plaster cornicing with some areas lined with timber paneling. Timber joinery is intact throughout with varnished finish. At the base of the public staircase is a memorial board enclosure with decorative timber screens. Floors are lined with terrazzo. A single pendant light hangs centrally from the ceiling. Other rooms on this level have similar though simpler detailing. In the former public office to the west, walls are hard plaster with elaborately moulded cornices. Timber joinery including architraves, window sashes and skirtings are painted though some timber joinery in the former public office has a varnished finish. Full-height partition walls have been erected in the former post office public space. Floors are lined with recent carpet. Door furniture has generally been replaced though some china and brass door handles remain. Access to the first floor is via an elegant timber staircase with walls and balustrades of paneled timber. A round handrail is fixed with brackets to the balustrade and follows the curve of the staircase. Treads and risers are lined with carpet. Natural light enters the stairwell through the large arched leadlight window which is framed by wall mounted Art Deco light fittings. The vaulted ceiling over the stair is simply detailed and forms an archway to the upper vestibule. The upper level vestibule has walls lined with hard plaster and timber-paneling. Plaster ceilings have moulded plaster cornices. Timber skirting boards, architraves architrave blocks are intact throughout the room and all interior timber work and joinery has a varnished finish. Internal openings are generous in height and doors feature tall glazed pivoting fanlights. The first floor offices have varnished joinery including doors, architraves and picture rails and unusual decorative pelmets. Skirtings in these rooms have been painted. The council chamber is a finely detailed room with timber-paneling to the perimeter of the room including columns. Early glass, wall-hung pendant lights remain. Floors are carpeted. The tower is accessed from the first floor via a narrow timber staircase and by timber ladders within the tower itself to the clock and bell chamber. 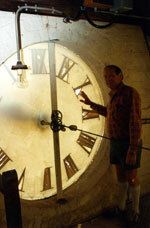 The clock is in working order with faces, featuring Roman numerals, housed in each elevation. Above the clock, a bell chamber contains a bell and hammer. The bell is formed from cast metal and both the bell and the hammer are painted - the crown and yoke are hidden behind a fibrous cement soffit. The bell chamber is screened in each corner by louvred timber panels. Few early furnishings remain in the building apart from honour boards, framed portraits and timber seating in the upper vestibule. Early brick foundations are visible in the basement along with the timber floor boards, joists, posts and beams. Rock formed retaining walls also remain. Walls to the eastern end of the basement are rendered and have concrete slab floor. To the east of the Town Hall is an asphalt carpark where a 1938-39 garage is located. The double garage with gabled roof clad in pre-painted corrugated metal sheeting is contemporary and sympathetic to the Town Hall addition. It has a masonry facade to Caledonian Hill with other walls timber framed and clad in fibrous cement sheet, all with a painted finish. Mown lawns and trimmed hedges address the fiveways intersection which is separated from the building by wrought iron picket fencing and a stand of palm trees. The setting to Caledonian Hill is more utilitarian with a wide paved footpath abutting the building at the boundary line. The building's bell tower can be seen from various hillside locations within the town and as such symbolises and reinforces the importance of civic leadership and is a significant landmark in Gympie. The building dominates its site and together with its tall bell tower has a powerful presence in the streetscape. It is a landmark within Gympie and forms part of a majestic group of late 19th century buildings in the town. The former Gympie Maternal and Child Welfare Clinic faces north-west onto Mellor Street and is flanked by the entry to the council car park on the northern side and the Town Hall on the southern side. With its symmetrical form and portico derived from a classical temple it displays elements of an Interwar Classical style. It is a single storey reinforced concrete structure with a painted roughcast finish, a multi-hipped roof clad in pre-painted square-fluted sheeting with battened eaves and an original fleche centred along its main ridge. Two concrete steps and a recessed concrete paved portico flanked by four Tuscan columns form the entrance to the building from Mellor Street. Original exterior joinery generally survives to all elevations with original obscure glazing to all fanlights and doors. Windows generally comprise single or paired six-light timber casements with two or four-light fanlights above respectively and timber sills. The bathroom in the south-east corner has a smaller pair of four-light casements. Original doors comprise a six-light french entrance door, a six-light high waist rear door and a four-light high waist female public toilet door, all with four-light fanlights above. Some fanlights have been removed to accommodate air conditioning units with fixed aluminium louvred awnings over and the single casement toilet window on the north-east elevation has been infilled. The building, which in 2011 is the office for Gympie Regional Council's Youth and Community Development, is generally square in plan and symmetrical in layout retaining its original partition walls with rooms opening off each side of the former waiting room and rear corridor. To the left, from front to back, are the former doctor's room and treatment rooms; and to the right are the former mother's retiring room, external female public toilet, nurse's bedroom/bathroom and kitchen. The former retiring room has been adapted as a store and the toilet remodelled. The nurse's bedroom incorporates a large storage cupboard. The kitchen retains its 1960s fitout and the former nurse's bathroom with raked ceiling is now used for storage. Most internal doors have been replaced with sliding doors but borrowed lights with obscure glazing remain. Ceiling are lined with fibrous cement sheeting. The ceilings are lined with fibrous cement sheeting and cover strips, decoratively placed. All ceilings retain lattice ventilation panels with some partially concealed by later fluorescent light fittings. Interior walls are a combination of rendered concrete and fibrous cement sheeting .with cover battens Ceilings are fibro with decorative placement of the cover strips, as defined by the original architect's plans. The former clinic is flanked at the front by a rendered concrete fence with metal balustrade and metal gate on Mellor Street. Entry to the female public toilet is via a timber ramp and landing, accessible through a timber gate from Mellor Street. This ramp is supported by timber posts. A privacy screen of lattice has been erected around the landing. An original enamelled cast iron sink is situated on the landing for hand washing. Under the landing there is access to a storage space under the building. The landing outside the back door also has a lattice screen. Four timber steps descend to a concrete slab. The building retains a cylindrical galvanised iron water tank on a concrete stumped tank stand, located external to the bathroom and kitchen area. The Art Deco Men's Toilet Block is located in the northern corner of the reserve and fronts Mellor Street amid an elevated garden bed of native shrubs to the rear and sides at the corner of Alma Street. To the rear of the building is the Town Hall public carpark, the entrance of which is west of the toilet block. The Art Deco Men's Toilet Block is a small masonry T-shaped building with a stepped parapet concealing gabled roofs clad in corrugated pre-painted metal sheeting. It is constructed of mid-brown face brick on a concrete base and with painted cement rendered banding at shoulder height extending across the parapet at the front and continuous around the building to the fascia board. The Mellor Street elevation comprises two simple entrances at each end beneath a continuous rendered masonry hood. Above the hood, three centrally located vertical fins extend to the top of the parapet between a simple string course above which a short stretcher course of brick is featured in the parapet on either side of the fins. A fluorescent light is located centrally on the horizontal hood below the decorative fins. Openings in the side elevations are limited to two high-level terracotta vents and the rear elevation has a projecting gable with a central vertically aligned window. Each side of the projecting gable is a window of the same dimensions but with a concrete block and breeze block infill. The gable to the main roof has flat sheet cladding with three vertical, decorative timber cover strips. The toilet block comprises two rooms, with both entrances opening into the larger which houses a stainless steel urinal fixed along the front wall of the building. On the opposite wall, to the left of stainless steel hand basin, is the entrance to a single lavatory stall. The lavatory window opening is fitted with a small profile steel window grille providing light and ventilation together with a ventilation screen located above the door head along the length of the stall wall. A box fluorescent light is sited above the hand basin. The interior has painted brickwork walls, a battened fibrous cement sheeted ceiling and a tiled floor. The interior fittings are not regarded as significant. Gympie Town Hall was opened in 1890 on land reserved for this purpose in 1883. It was designed by&bnsp;Clark Brothers, which won competitions for proposed town halls for Brisbane and Gympie in 1884 and Warwick in 1885. Of the Clark Brothers' prize-winning designs for Queensland town halls, only that for Gympie may have been realised, and its construction was supervised by H W Durietz in the late 1880s. It was extended in 1938-9 by Brisbane architect C H Griffin. Gympie (initially Nashville) arose after the discovery of gold in the Mary River district in October 1867. The new goldfield established Queensland as a significant gold producer and contributed much needed finances to the young colony. Thousands of people arrived at the Gympie goldfield in the months after the discovery and a fledgling settlement emerged. In a year the alluvial gold had been exhausted and shallow reef mining commenced, followed from 1875 by deep reef mining. During 1881 mines began yielding large amounts of gold marking a new era of wealth and prosperity for Gympie as an intensive phase of underground reef mining began, facilitated by the injection of capital into mining companies for machinery and employees. As Gympie evolved from a hastily established mining settlement, the early makeshift structures of the 1860s gradually gave way to more permanent and substantial public and private buildings from the mid 1870s. Gympie was gazetted as a town on 26 January 1880 and in 1883 a reserve for a town hall was created. A competition for the design of a Gympie Town Hall was conducted and in 1884 Clark Brothers (comprising John James Clark, architect and his brother George, an engineer) were named as the winners. Other buildings designed by Clark include the Treasury Building, Brisbane [QHR 600143], Central Railway Station Tower, Brisbane [QHR 600073] and Townsville Railway Station [QHR 600906]. Clark had a long career, won many design competitions and produced many other notable buildings in Victoria, New South Wales, West Australia and New Zealand. Gympie Town Council proposed to erect its town hall on land at Nash's Gully bounded by Mellor Street and Caledonian Hill which was to be reserved for this purpose. In July 1888 the Council requested that the Department of Public Lands grant them the Deed of Grant for the land as they proposed to erect a Town Hall upon it, but the Department of Public Lands agreed to issue the Deed of Grant only after the erection of a town hall on the site.In August 1888 a proposal that Gympie Town Council borrow £5,000 for the erection of a Town Hall was defeated by 40 votes. Subsequently the Municipal Council erected a portion of the Town Hall, namely the left wing and tower, built of brick at a cost of £1,266. Its construction was supervised by local architect, Hugo Du Rietz and its builder was Joseph Jew. The town hall was opened by William Smyth MLA on 4 March 1891 and the first council meeting held in the new chambers took place on the same day. In June 1891 a Deed of Grant to the Council of the Municipality of Gympie for 3 roods 22 perches 'as a site for a town hall and no other purposes whatsoever' was granted. Following its continued growth, Gympie was declared a city in 1905. As gold production declined to cessation in circa 1927, Gympie transformed into the service centre for its highly productive agricultural district noted for dairy and fruit-growing. As part of this evolution, the town centre shifted from upper-Mary Street near Commissioners Hill to lower Mary Street closer to the railway station, butter factory and fruit cooperative. By the mid- to late-1930s the Gympie City Council was considering completion of its town hall. 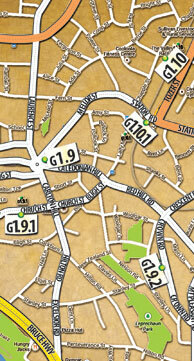 Concurrently, a post office located closer to the centre of town was sought. 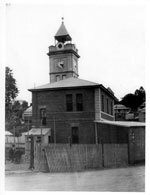 During 1937 the Gympie Chamber of Commerce called for a branch office in a central position in Gympie as the current post office located at the top of Commissioner's Hill was quite removed from the main business centre. The Gympie City Council wanted the branch located in the Town Hall where adequate accommodation for the purpose could be made available in the proposed extensions to the building. The federal member for the Gympie area, B H Corser made representations to the Commonwealth's Posts and Telegraphs Department. Additionally, the acting Prime Minister, the Right Hon Dr Earle Page, also discussed the establishment of a branch post office in Gympie with the Postmaster-General in June 1937. Subsequently tenders for the lease of a building for a branch post office were advertised in the Gympie Truth and Gympie Times. Two tenders were received that were regarded as unsatisfactory so approval was given for the lease from the Gympie Town Council of premises at Gympie for a period of 10 years with an option for renewal of five years. Consequently, when additions to the Gympie Town Hall were designed by C H Griffin in 1938 the design incorporated a new post office for Gympie on the ground floor. The addition included a reception hall on the first floor and additional offices on the ground floor. An original drawing by J J Clark shows that Griffin used the Clark Brothers' plan as the starting point for his design of the town hall extension in 1938. Griffin's plan provided for new vestibules on both floors and a new staircase. The upper floor houses a reception hall to the east of the upper vestibule. The existing frontage was remodelled in harmony with the new section. Instead of the Victorian ornamentation originally specified he gave the building's exterior a more modern appearance. A garage located adjacent to the town hall on the Caledonian Hill frontage was also designed as part of the project. The tender to construct was won by Marberete Company Pty Ltd of Brisbane and the work took seven months to complete. In addition to the town hall building a free-standing garage was built to the east of it on the town hall reserve. The Gympie Town Hall's additions were officially opened by the State Treasurer (Mr F A Cooper) on 21 October 1939. The cost of the addition and renovation was £9,668. This amount was covered by a loan of £7,235 with a Government subsidy of £1,463 plus £970 advanced from general rate revenue. The completion of the Gympie Town Hall in 1939 was part of a wider pattern of civic building that took place during the second half of the 1930s when numerous town halls were constructed across Australia as an expression of civic pride when the economy was once again on a more secure foundation after the Great Depression. Many Queensland country towns erected or remodelled civic buildings. The Queensland government played an important role in facilitating many of these projects, by subsidising expenditure by shire councils on new buildings or remodelling their existing premises. As a result, more than 20 shire and town council buildings were erected during 1938-39 and six shire halls were remodelled. In the last two years of the 1930s, more than £177,000 was spent on new shire and council halls and nearly £20,000 was outlaid on alterations to existing buildings. Town halls of varying design and dimension are landmarks of Australia's cities and suburbs, shires and towns. They have been important as social venues and focal points for their communities and also for the administration of local government. The Gympie Town Hall was such a venue. The accommodation of the Gympie East Post Office on the ground floor of the new section of the Gympie Town Hall between 9 May 1939 and 26 July 1967 gave it further important social function. 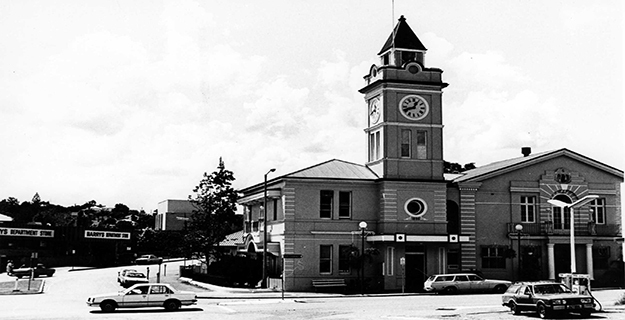 Between 1977 and 1982 internal alterations to the Gympie Town Hall were undertaken with money obtained through a debenture loan approved by the Queensland Treasury. These included architectural work (probably new joinery); mechanical and electrical alterations to the auditorium; internal telephone extension relocation and switchboard installation; internal painting of the ground floor; reconstruction of the WWI remembrance alcove; new floor coverings; office equipment; and glass and timber panel partitions. 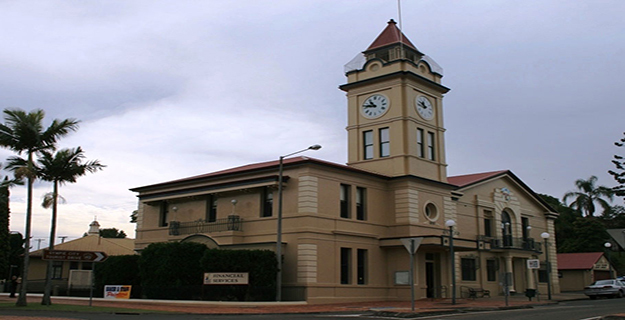 In 2009 the Gympie Regional Council recommenced meeting in the Gympie Town Hall, after many years of meeting in the former Queensland National Bank building in Channon Street. The remainder of the building continues to be used as office accommodation for council staff. 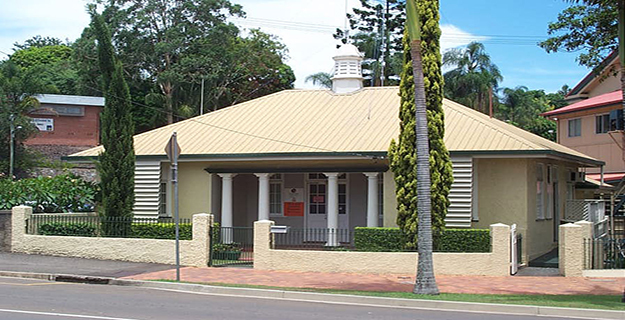 The former Gympie Maternal and Child Welfare Clinic is located in the Town Hall Reserve, facing Mellor Street in central Gympie. It is a concrete rendered building, with an entry portico flanked by four columns, with a rib and pan profile iron roof, including the original fleche. Designed and built by the Department of Public Works, and opened on 24 April 1926, the building is one of ten regional clinics built to a standardised design, of which, only nine remain. The establishment of baby clinics throughout Queensland following the introduction of the Maternity Act 1922 was part of a national and international movement to improve the health of mothers and babies. The Act also initiated the establishment of a network of free maternity hospitals throughout Queensland, managed under the Motherhood, Child Welfare and Hospital Fund. Financed through the profits of the state run lottery, the Golden Casket, established in 1920, the Act sought to decrease the death rate for mothers and babies; to increase the birth-rate; to expand outback settlement and to train mothers how to care for children and essentially develop a healthy population. The first baby clinic in Brisbane was established in 1908 and attended by paediatrician Dr Alfred Jefferis Turner, who saw up to 100 babies a week, free of charge. Dr Jefferis Turner was the first resident medical officer of the Brisbane Children's Hospital, appointed in 1889. He made a significant contribution to the development of a diphtheria antitoxin and identified lead in paint as a significant factor in lead poisoning in children. These advances impacted on the reduction of infant mortality rates, but Dr Jefferis Turner was aware that diarrhoeal disease was still a major factor the demise of many babies. There was a higher death rate during the summer months, which could be attributed to poor infant feeding and he embarked on a public health campaign to educate mothers in the hygienic preparation of food, particularly for those infants not breast fed. Following a conference on child welfare in Sydney in 1916, representatives of women's organisations, benevolent societies and the Creche and Kindergarten Association lobbied the Home Secretary, John Huxham to establish a network of baby clinics in Queensland. In August 1917 he announced that three clinics would be built, which was later expanded to four. At that time the first baby clinic had just been built in Victoria, while New South Wales already had eleven. All were based on the philosophy of New Zealand Doctor, Frederick Truby King, which promoted breast feeding, the training of nurses in maternal and infant welfare and the education of mothers in domestic hygiene. A national agenda for public health and social reform was implicit in the growth of the town planning movement. The second Australian Town Planning Conference and Exhibition held in Brisbane in mid 1918 included a display illustrating the proper care of babies. The organiser of this conference was Charles Edward Chuter, an officer of the Home Secretary's Department, who was to have a significant impact on local government and on the health system in Queensland. He had managed the finances of the Brisbane General Hospital from 1917, and sought the means to implement the social policies of the recently elected Labour government of T J Ryan. Chuter established the Motherhood, Child Welfare and Hospital Fund, which was financed through the Golden Casket Lottery. He also had significant input into the drafting of the Maternity Act. The decision to operate a regular lottery from 1920, with the profits deposited into the Hospital Trust Account, financed a major building program in maternity hospitals and baby clinics. The first government baby clinic opened in a rented cottage in Brunswick Street, Fortitude Valley on 8 March 1918, managed by Matron Florence Chatfield of the Diamantina Hospital. Three more clinics opened shortly after at Woolloongabba, Spring Hill and West End. Nurse Chatfield travelled north in October 1920, seeking suitable sites to build clinics in Cairns, Townsville and Rockhampton, preferring a central location, close to the shopping areas and close to public transport. She also sought support from at least one doctor in each town to act as the Honorary Medical Officer, attached to the clinic. Between October 1923 and November 1924, new baby clinics were erected at Rockhampton, Townsville, Ipswich, Toowoomba, Cairns, Maryborough and Bundaberg. The Fortitude Valley Clinic, which opened in 1924, included a training school for nurses. The training centre staff had been educated in both New Zealand and Sydney and the centre produced eight graduates in 1924 and eleven in 1925. Thirty-five maternity wards were built in hospitals across the state at this time. 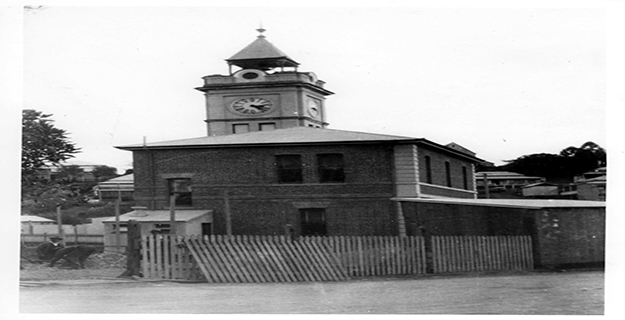 Between 1926 and 1930 clinics were erected at Gympie, Mackay, Charters Towers and Warwick, with new substantial brick clinics built at Woolloongabba and Herschel Street in the city. Another large clinic was planned for South Brisbane but was never built. A compact tile-roofed one-storey reinforced cement plaster building of attractive design, containing waiting hall 16 ft by 16 ft; a doctor's room 12 ft by 11 ft; treatment room 13 ft by 11 ft; retiring and nurses rooms 11ft by 10 ft with water closet, lavatories, store, press etc. Modern fittings and furnishings have been installed throughout and a septic system provided for conveniences. The Cairns clinic which opened in January 1924 was not of the standard design, being a larger high set timber structure, built on part of a railway reserve fronting Martyn Street. The selection of a site for a baby clinic for Gympie occurred during the early part of 1925 with regular correspondence between the local MLA, Tom Dunstan, the Assistant Minister for Works and the Home Secretary James Stoppard. The Under Secretary George Chuter and the Mayor Alderman George Thomas undertook a site inspection on 7 March and agreed that part of the Town Hall Reserve facing Mellor Street was the best location. The council agreed to allocate a site within the Town Hall reserve, because the clinic would be of benefit to the district. It passed the resolution on 19 March 1925, and verbal agreement was made by the council that it would provide fill for the site. The architect William Ewart visited in April and assured the Town Clerk that the plans and specifications were in hand and the building would be completed as soon as possible. The proposed building was specified as a concrete one storey structure with a Marseilles tiled roof and Doric pillared entrance, including a waiting room for mothers, infant's treatment room, kitchen, bathroom, ladies' retiring room and day room for the nurses. The standard design baby clinics were all founded on the same plan drawn up in January 1923, with some amendments to suit each individual site. The Gympie Clinic was built with two toilets; one accessible from within the clinic, and one with anexternal door, adjacent to the Town Hall, accessible to the public. (A separate men's toilet was located nearby.) Two nurses were appointed to the clinic, with one stationed at the clinic and the other largely devoted to visiting mothers in their own homes within the district. The building, which cost £2,355, was opened on Saturday 24 April 1926 by the Minister for Works, James Kirwan. He referred to the clinic as the 'Temple of the Babe', an analogy first used by theAssistant Home Secretary Mr Brennan at the opening of the Toowoomba Baby Clinic in December 1923. Kirwan reiterated the government policy promoting motherhood and child welfare, indicating that the clinic had already begun operation prior to the official opening. Nurse McGrath had already begun her rounds of the district, visiting 83 babies, and 25 mothers had consulted the clinic. He said the building, was a beautiful structure which was an architectural adornment to the city of Gympie. When the Director of Infant Welfare, Dr Jefferis Turner wrote his first annual report in June 1927, he indicated that the Gympie Clinic had a good relationship with the local maternity nurses, andit had outperformed some older ones in the state, in terms of the numbers of new born babies visited by the clinic sisters. In 1933, the Gympie Town Clerk advised the Department of Works that a large amount of spoil had been generated in the process of excavating for a new sewer. This had been used to fill the Town Hall Reserve, but had in fact filled part of the lower flight of steps at the rear of the baby clinic. It advised that the landing would be extended to provide easier access to the clinic and the remainder of the lower steps would lead to the yard. During the early 1930s the clinic sister experienced difficulties sleeping because of the constant noise from the public toilet in the clinic building adjacent to her bedroom. At that time it was agreed to lock the female toilet at 11.00pm.The back landing was enclosed with lattice in 1936. By 1941, heavy rain had caused subsidence of this and earlier fill, causing damage to the back steps and requiring the installation of a 6 foot (1.8m) square concrete slab at the foot of the stairs. The Gympie Town Council wrote to the Department of Public Works in June 1950, indicating that the town hall was being repainted and suggested that the baby clinic be painted at the same time. Tenders were called in September and the exterior painting proceeded. Some interior painting was also carried out at this time with repairs to the front stairs and front gate, and painting of exterior Venetian blinds. In 1956 the interior walls and furniture was painted. The connection of sewerage in May 1964 led to further alterations and additions to the interior including a complete internal and external repaint, in pastel shades. The bathroom was upgraded with a new bath and hand basins. New cupboards were built in the kitchen and new linoleum was laid throughout. The furniture was also repainted. Plans for further additions to provide living accommodation were drawn up in April 1964. The proposed 22' by 21' (6.7m by 6.4m) extension was to comprise two bedrooms, a bathroom, laundry, WC, dining room and new street access. However the Gympie City Council was in opposition to any extensions to the clinic because it would partly encroach on recent improvements to the car park, and new access roadways within Town Hall Reserve. The council wrote to the Secretary of Lands Administration enquiring as to the original agreement reached in relation to land allocated prior to the construction of the baby clinic. The Land Administration was unable to present any formal documentation of the initial allocation of the site, as it had been the product of a verbal agreement between the MLA at the time, the Hon T Dunstan, the Mayor, Aldermen and Town Clerk of Gympie. While the council passed a motion approving the erection of the baby clinic on the Town Hall Reserve, it appears that no formal agreement was made on land allocation for the clinic. The planned extensions did not proceed. It is unclear when the tile roof was replaced with iron, but a number of clinics had experienced problems with the tiled roof, with the Townsville clinic's replaced by 1927. The Maternal and Child Health Clinic services were transferred to the Gympie Hospital in 1992. The former baby clinic building was then occupied by the State Emergency Service (later the Gympie Regional Emergency Management Team) for fifteen years. This team was transferred to Caloundra in 2007. The Cooloola Family and Community Development Workers then mounted a petition to request a lease of the building to re-establish a clinic providing maternal and child health services, collaboratively run by the Cooloola Community Hub staff and the Gympie Child Health Services. It appears that no action was taken on this proposal. The Gympie Regional Council's Youth Development Unit now occupies the building. The Art Deco Men's Toilet Block in Mellor Street and sited on Gympie's Town Hall Reserve was erected circa 1920s. It is one of only two known toilet blocks in this architectural style in Queensland, the other reported to be at Mareeba. Public toilets in Mellor Street were in existence in 1925 as Council minutes reveal that the Chamber of Commerce requested the provision of a light at the public lavatory in Mellor Street. However, the toilet block does not appear on a partial site plan for the reserve drawn in 1925 when the Gympie Maternal and Child Welfare Clinic was being planned for the site. The Art Deco toilet block does not reflect the architectural style of the nearby Gympie Town Hall (designed 1938), which leads to the conclusion that the toilet block was constructed before 1938. Gympie Town Hall Reserve Complexis a place that satisfies one or more of thecriteria specified in s.35(1) of the Queensland Heritage Act 1992 as evidenced by,but not exclusive to, the following statement of cultural heritage significance, based on criteria A, B, D and E.
As the product of Gympie's gold mining and later agricultural settlement, the Gympie Town Hall Complex is important in demonstrating the evolution of Queensland's history. The Town Hall, designed in the mid-1880s and opened in 1890, represents the endurance and continued importance of Gympie to Queensland as a highly profitable gold mining town. The Gympie Town Hall's extension in the late 1930s reflects Gympie's evolution into the major service town of an economically important dairy and agricultural district for Queensland. The former Gympie Maternal and Child Welfare Clinic (1926) is important in demonstrating the pattern of Queensland history concerned with improving maternal health, which was part of the Australia-wide movement to educate mothers in infant and domestic hygiene. It is one of ten standard design baby clinics constructed in regional Queensland that resulted from implementation of the Maternity Act 1922, which used funding from the state-operated lottery, the Golden Casket. The Gympie Maternal and Child Welfare Clinic, which served the Gympie district for 66 years, is representative of Queensland's response to the Australia-wide endeavour to reduce infant mortality and improve maternal health during the 1920s. 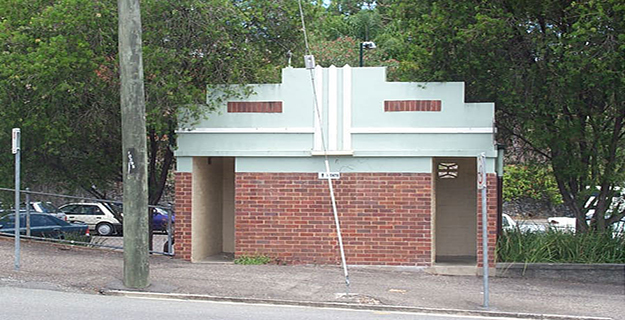 As one of only two known examples, the Art Deco Men's Toilet Block built in Mellor Street on the Town Hall reserve in the 1920s is a rare example of Art Deco design used for a public toilet block in Queensland. 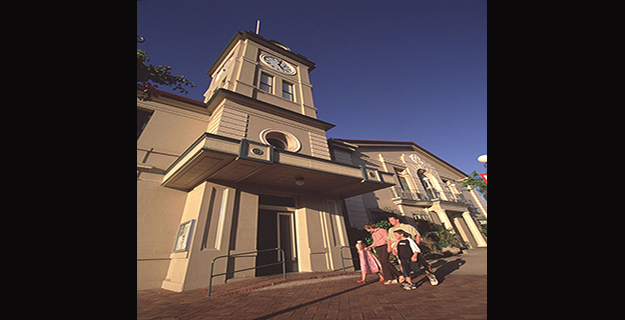 The Gympie Town Hall demonstrates the principal characteristics of a regional town hall. 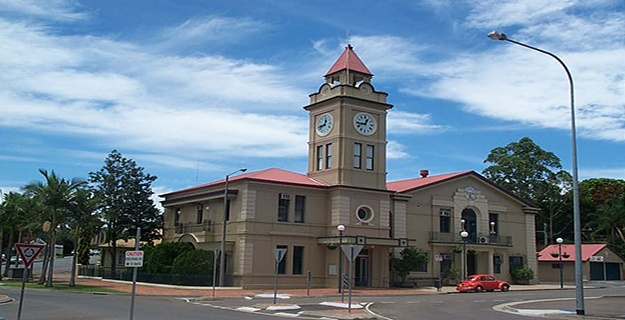 Located in a prominent position near the centre of the town, the Gympie Town Hall is a substantial two-storey building with a dominant clock tower. Its interior includes the council chamber, meeting room, staircase, honour roll and original offices. The original design of the Gympie Town Hall was by Clark Brothers and it is specifically the work of noted architect John James Clark. The former Gympie Maternal and Child Welfare Clinic demonstrates the principal characteristics of the Queensland Department of Works standard design for regional baby clinic buildings in the 1920s. These include a spacious waiting room, doctor's room, treatment room, nurse's room, bathroom and toilet. Also, the building's central location in Gympie is typical of the siting of early regional clinics. The integrity of the building has been retained including the original room layout, along with most of the interwar features of the building. The Gympie Town Hall Reserve Complex forms a harmonious group around the Gympie Town Hall with the smaller classically inspired Maternal and Child Welfare Building and Art Deco Toilet Block adding visual interest as the group extends along Mellor Street and Caledonian Hill. The elegant, classically inspired Gympie Town Hall stands prominently at the five-ways that terminates Mary Street and the main business district of Gympie. 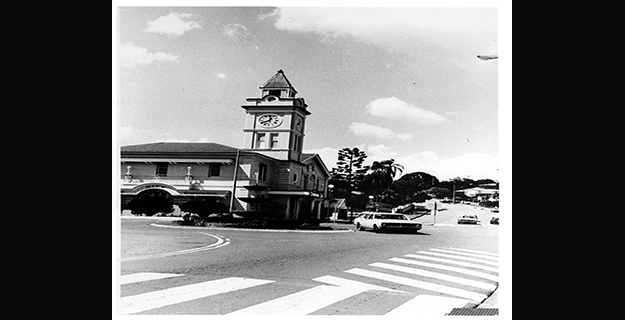 In Gympie's hilly terrain and irregular road layout, towers such as those of the Gympie Town Hall and Gympie Court House [QHR 600533] stand as important navigation aids around the city centre. The Gympie Town Hall has aesthetic significance for its classical composition and detailing and for its fine interiors including extensive timber joinery; and decorative plaster work, glazing and terrazzo floors. The Gympie Maternal and Child Welfare building has aesthetic significance as a well-designed building with a domestic scale and character appropriate to its function. Notable for its classical temple front, the building makes a pleasing contribution to the streetscape.